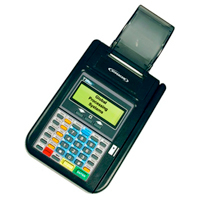 The Hypercom T7Plus is one of the most popular credit card terminals ever made. The T7 Plus, with 1MB of RAM, is both compact and highly advanced. The Hypercom T7 Plus is designed for merchants requiring a small countertop POS terminal. The terminal delivers a set of powerful features in an attractive, compact design. The Hypercom T7Plus is capable of accepting all magnetic stripe cards and provides fast transaction authorizations. For deployment, use the terminal “cloning” feature with a fast-load cable to download terminals even faster. Use a multi-loader to download up to 12 terminals simultaneously! Whether you’re looking for a reliable payment terminal, innovative, value-add technology, or a complete electronic transaction management system, Hypercom can deliver. Our product portfolio ranges from basic credit authorization to full transaction transport and more. Hypercom is more than a one-stop shop for payment terminals; it’s a provider of complete, end-to-end transaction solutions that expand the possibilities at the POS in ways that translate to greater profits.